Instructional Designers in Offices Drinking Coffee (IDIODC) is a weekly live videocast and podcast that focuses on helping our peers create better eLearning content and user experiences in an educational and entertaining way. 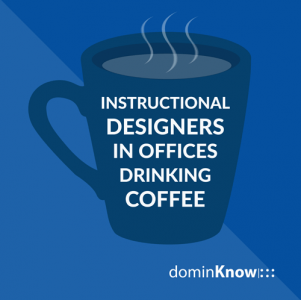 dominKnow Launches Live Video/Podcast "Instructional Designers In Offices Drinking Coffee"
dominKnow, a powerful eLearning authoring tool and LCMS software provider are pleased to announce the launch of Instructional Designers in Offices Drinking Coffee (IDIODC), a weekly live videocast and podcast. dominKnow began IDIODC to assist Instructional Designers (IDs) with the many challenges they’re facing in an evolving L&D landscape driven by technology. IDIODC is a weekly videocast focused on the many challenges IDs face daily in the Learning and Development world. The goal is to help our peers create better content and better user experiences. IDIODC is hosted by dominKnow’s Community Manager, Brent Schlenker, and SVP Learning, Chris Van Wingerden. Brent brings over 20 years of experience in the L&D industry, having built and rebuilt training organizations, and developed innovative technology-based learning solutions across all departments within small, medium, and large organizations. Chris has worked in the eLearning industry for more than 15 years, helping client teams solve all kinds of training and development challenges. Chris has a deep background in learning and Instructional Design, and is always looking for ways to ensure any technologies used in training and development serve the critical purposes of learning, for both the organization and its employees. IDIODC episodes are approximately 30 minutes in duration and are available to watch as a live weekly videocast, recorded episodes, and as a podcast. Designed to educate and entertain IDIODC’s growing audience, IDIODC currently features eleven episodes. Interactive Video: What Can You Do? Why is Responsive Design So Darn Different? dominKnow is a powerful suite of eLearning Authoring Tools and Learning Content Management System (LCMS) designed to help teams do more. dominKnow speeds development with cloud-based authoring and workflows that empower teams to collaborate in real time, access every important file, share, reuse and update content, and easily engage SMEs in the review process. Our award-winning platform outputs single-source, multi-purpose HTML5, responsive, and WCAG AA compliant content and easily publishes to SCORM, AICC, xAPI and PENS standards. The goal of IDIODC is to help our peers create better content and user experiences in an educational and entertaining way.